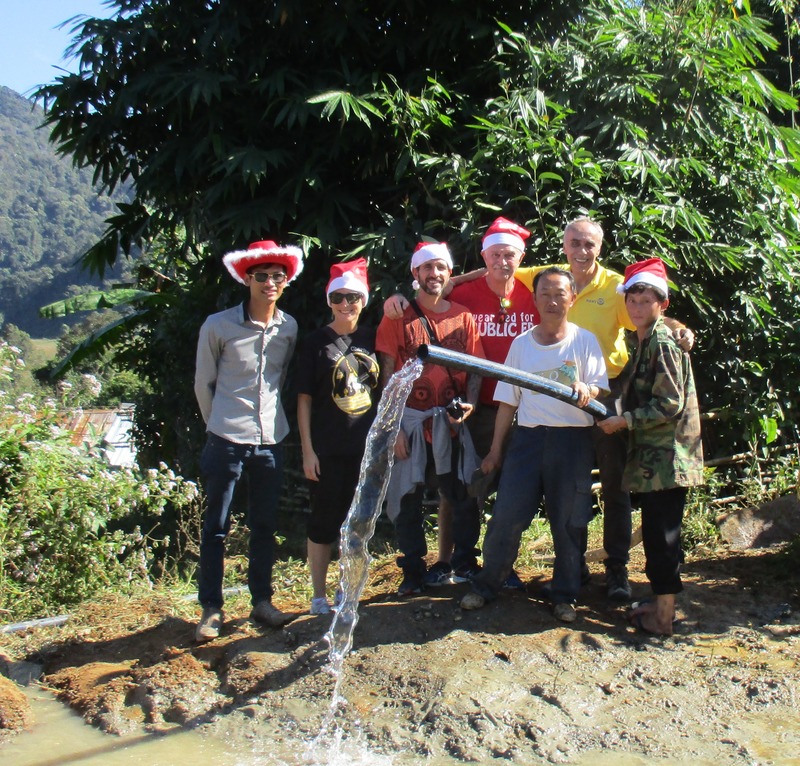 With the near completion of the first distribution of water filters to Nong Boakham, I spent the next two days emailing everyone in time for Christmas….just made it. It helped that I spent a little more to get high speed internet. Instead of taking 4-5 minutes per pictures, it took about 15 seconds each. 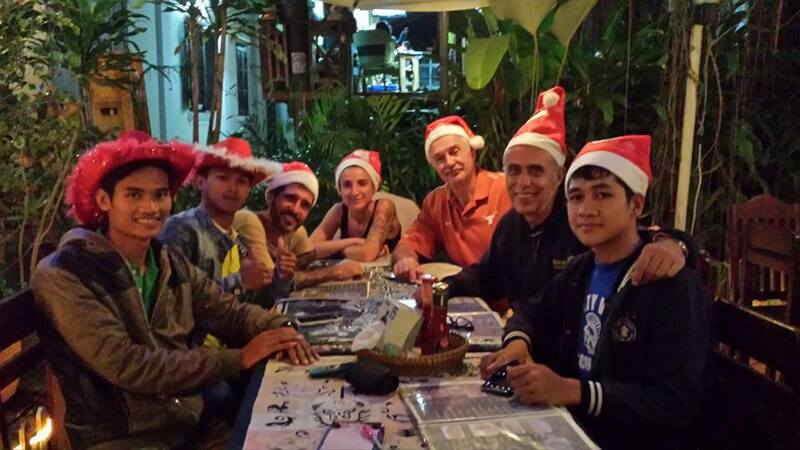 So Christmas came quickly – Our team celebrated our Christmas dinner at the Mango Garden restaurant – glad we made reservations. We had heard that rain was coming to Vieng Hin in two days, so we wasted no time. 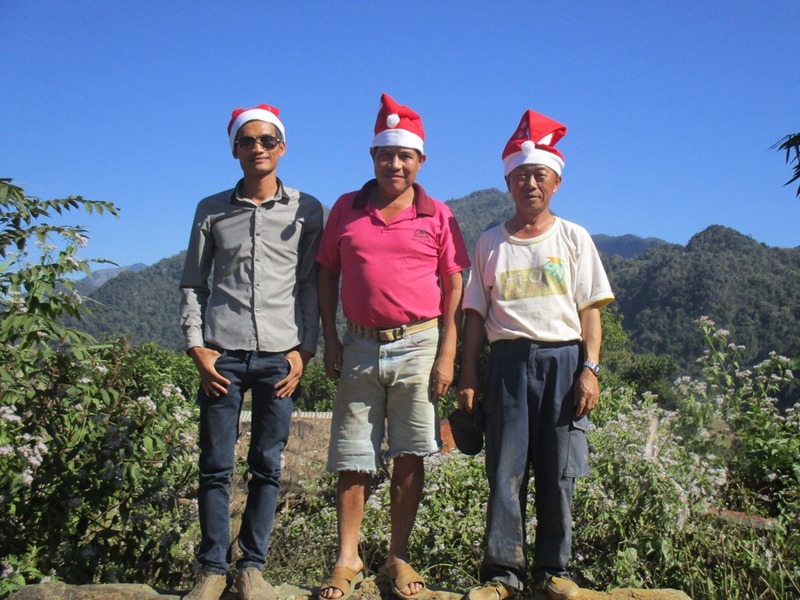 On December 26, we went up there to inspect the progress and check in on a cuple of other villagers while we were up that way. Of course we took our Santa hats too. 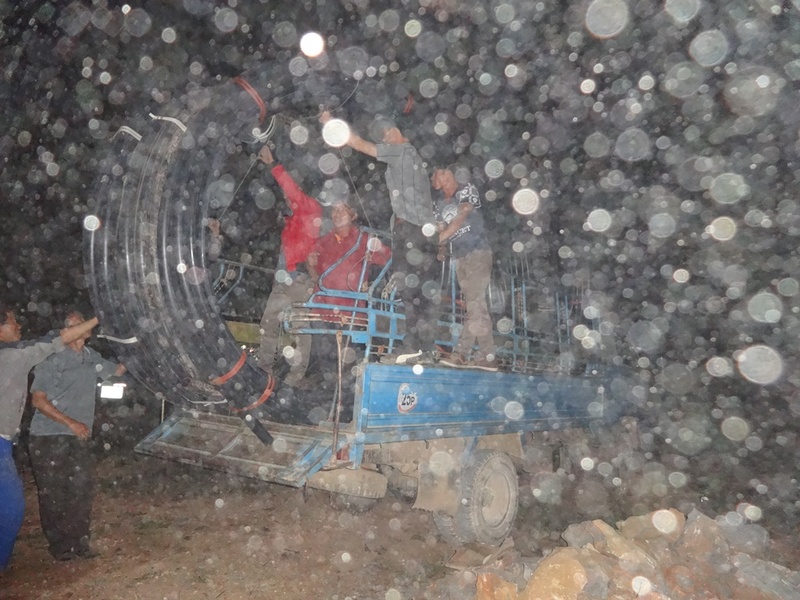 In just 4 days, the villagers had trenched 7km of ditch and laid the pipe – water was already running. Note the water tank under construction. They planned to start mixing the cement and pouring, the following day. Rather sobering – bomb oridnance right outside the school…perhaps as a reminder to the students of their history. We are considering building a school here net year – you can get a glimpse of the condition of this one…lots of termites too. The chief was kind enough to take us to the caves where the villagers and the entire district ran to for cover during the bombing raids. 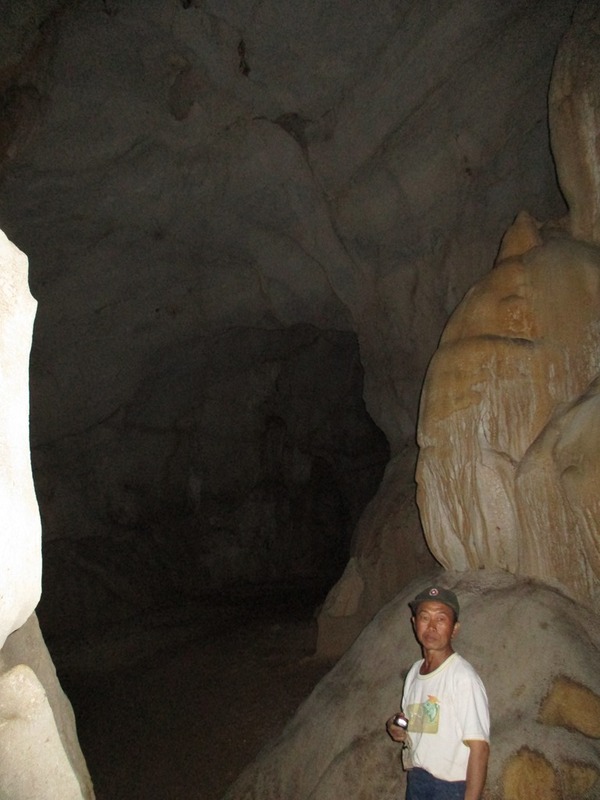 More than a thousand people lived in one cave (there are three) for year. 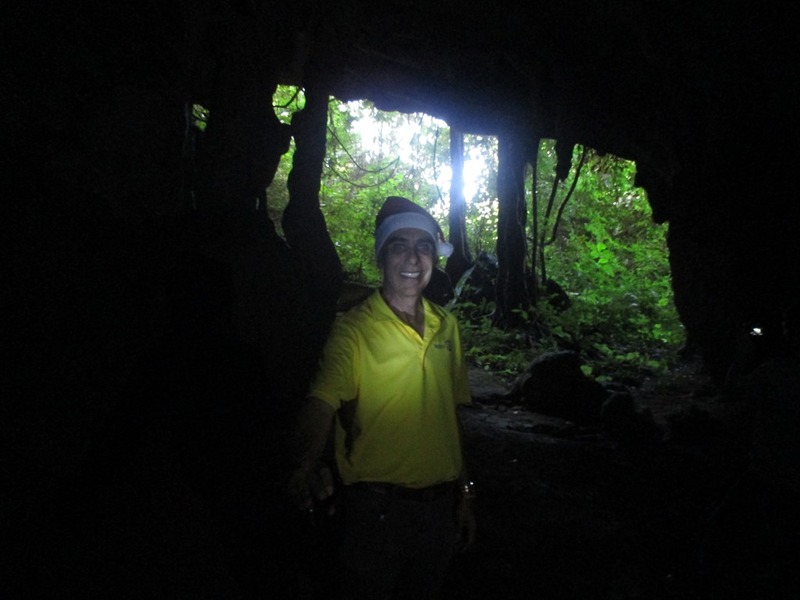 I will be showing a video of the caves upon my return but here are a couple of pictures. 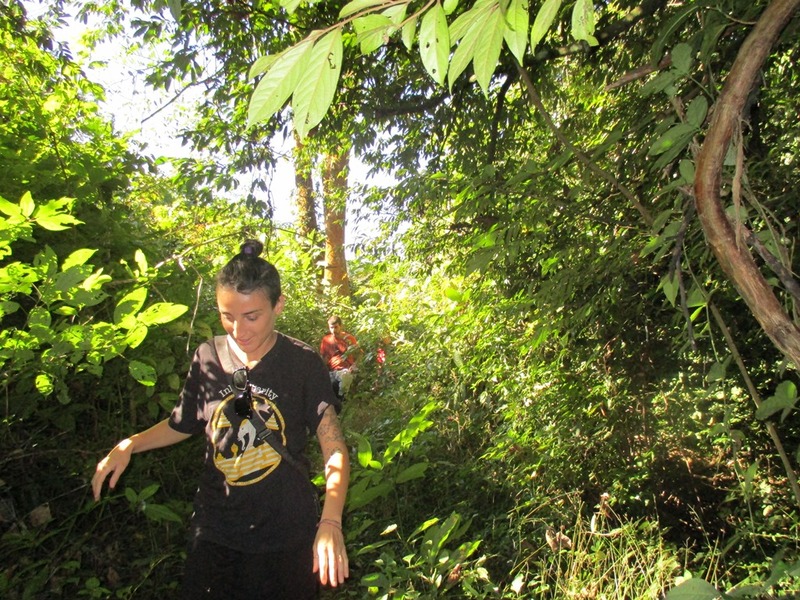 Trekking to the biggest cave. More than 1000 people stayed in this cave because it had a source of fresh water, water falls, a place to cook and even fish. The chief went to great lengths to talk about the helicopters with rocket launchers. So many people didn’t make it to the caves. Mind you, the local villagers kept this place a secret so their enemies wouldn’t give away the location. 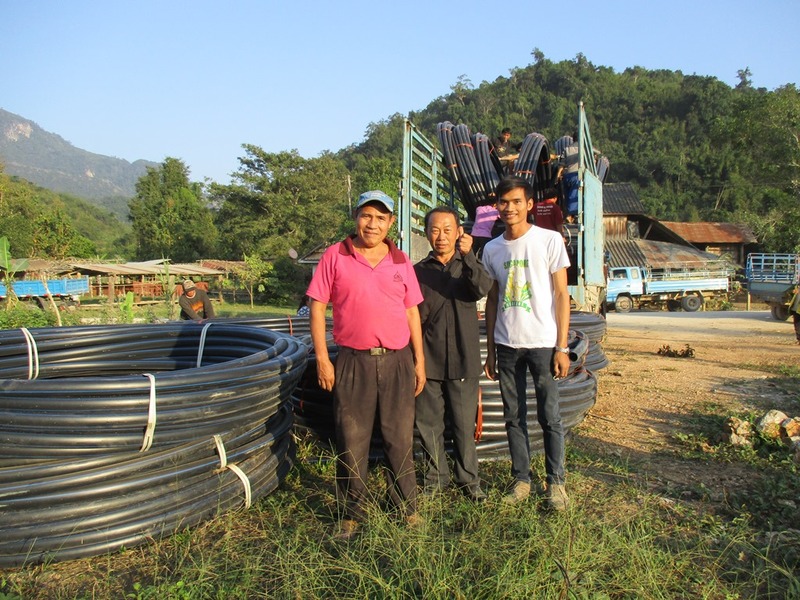 On our way back to Luang Prabang, we visited Ban Na Lea to check in on the school, the water project (completed the previous year) and one of the sponsored students. The path to the village was washed away in many parts and no makeshift bridge across the river. Once we got there, we noticed one boy pretty much by himself but other kids were helping him to move around. A closer inspection revealed that the kid was legally blind. He got virus when he was 9 months old (he is now 12 years), and had to have one eye removed. With the other eye, he can see a little motion only. This was very emotional to see, especially in a village who could offer him no hope whatsoever for the future. At least he has been stable for the last several years. We are currently investigating to see if anything can be done and will take him (and his father) to Thailand when I have to exit the country. I sure hope we can do something for him. It is so disheartening to see this and to know that nobody seems to care…even the father seems to have written him off. There wasn’t a dry eye among our volunteers when we were told this. If not there are blind schools that he may be able to attend and perhaps we will fundraise for support. The uneducated father basically offered his child to me…so sad. After they served us a lunch of freshly slaughtered and cooked chicken, along with Lao Lao and Beer Lao (cost me three cases – each equivalent to 24 bottled – man can they drink and we were only there for a couple of hours). It didn’t help that they kept refilling our glasses. 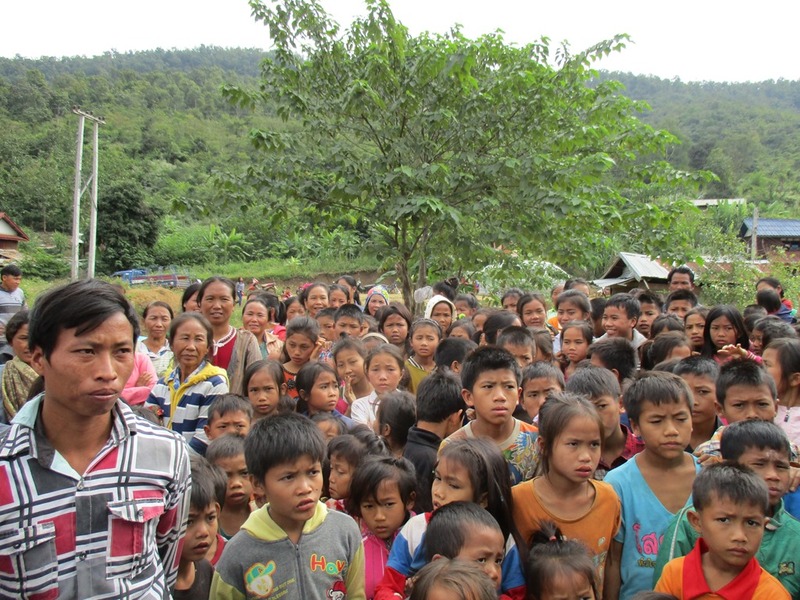 During our trip to Donesok, we stayed overnight so that we could attend a school opening with SKL (School For Kids In Laos). SKL is a Charity out of Winnipeg whose focus is schools. It was a heck of a drive to get there but here are a couple of pictures. 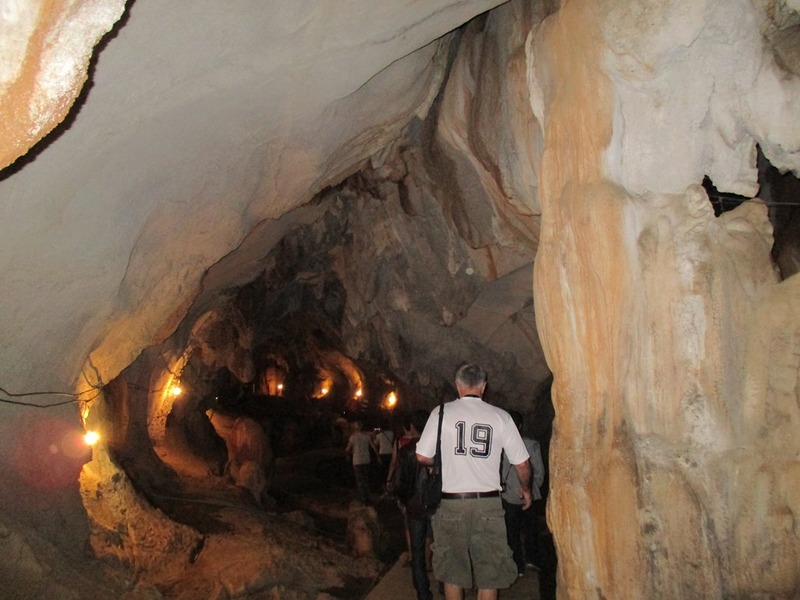 On our way back, we stayed overnight in Vang Vieng – I always wanted to go there to see the caves and to see what everyone was talking about. What a busy little place – lots of drunk tourists. Another significant hiding place for the local population during the secret war. 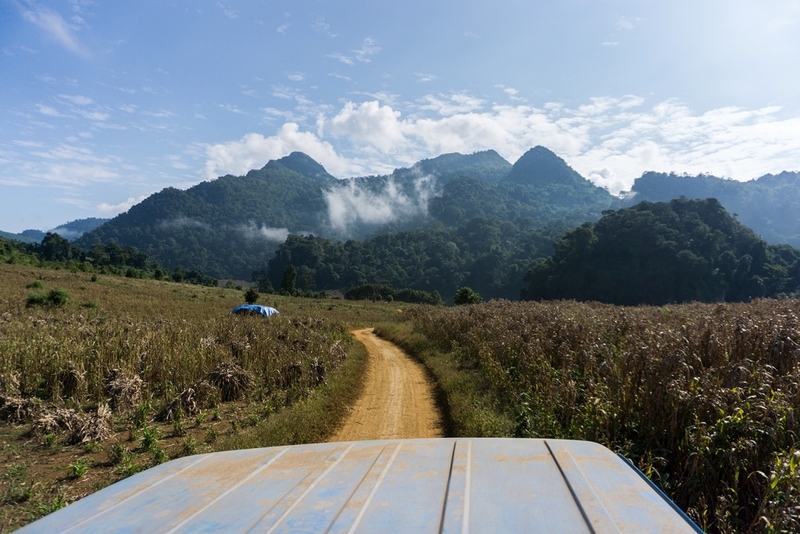 On our way back to Luang Prabang, there were lots of amazing views from the highlands. Lots of sharp turns and not much to stop us from going over the edge. Glad we didn’t try this at night! Up until 7-8 years ago, this was still very unsafe from Hmong tribesman that would ambush passersby. Our builder was a soldier there to help keep it safe. 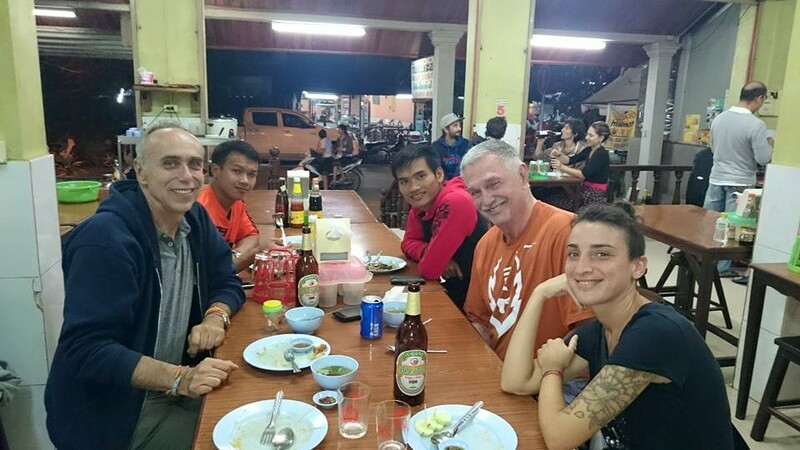 Once back in Luang Prabang, although tired from the trip, we didn’t have much time to waste. 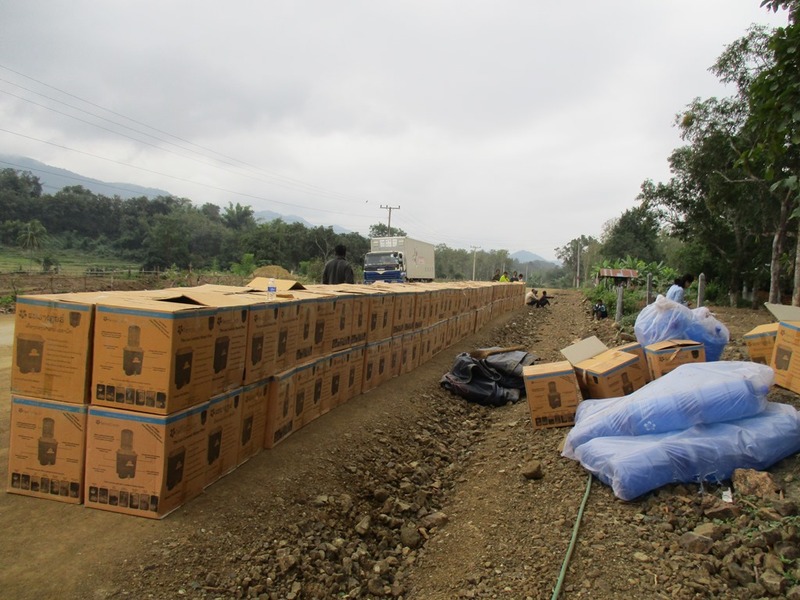 Our delivery truck of water filters had already arrived at the designated drop off point. 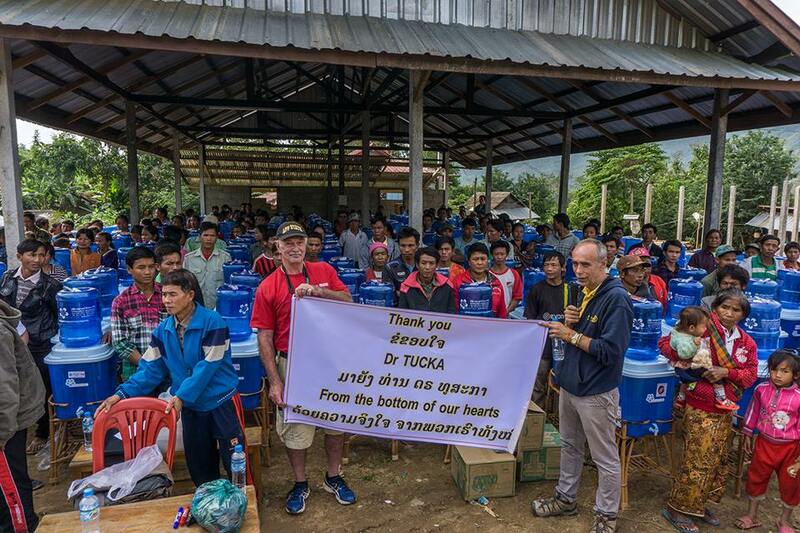 After a short few hours of sleep, we loaded up with lots of goodies and headed to off towards Nong Boakham, which was to be our largest, one day distribution ever. The truck was unloaded but based on past experiences, Siphan decided to open each box to make sure there was no damage during shipment. Low and behold, there was a lot of damage! Off to the right you can see some of the boxes where there was significant damage inside. Apparently a skid fell over when they were loading the truck, as reported by the driver. We had expected an element or two to be broken so we ordered extra pots just in case. 9 were broken, pus two damaged bases and a few items missing too. These filters are stacked on the side of the road awaiting more smaller trucks to arrive for the second loads. This gives you an idea of the magnitude of the distribution. Here we are waiting for additional deliveries by smaller trucks. A few of the villagers starting to gather…wait until you see the next picture! We had informed the provincial hygiene office that we would be there that day. They took it upon themselves to join us for a POLIO IMMUNIZATION DAY and asked us to participate. 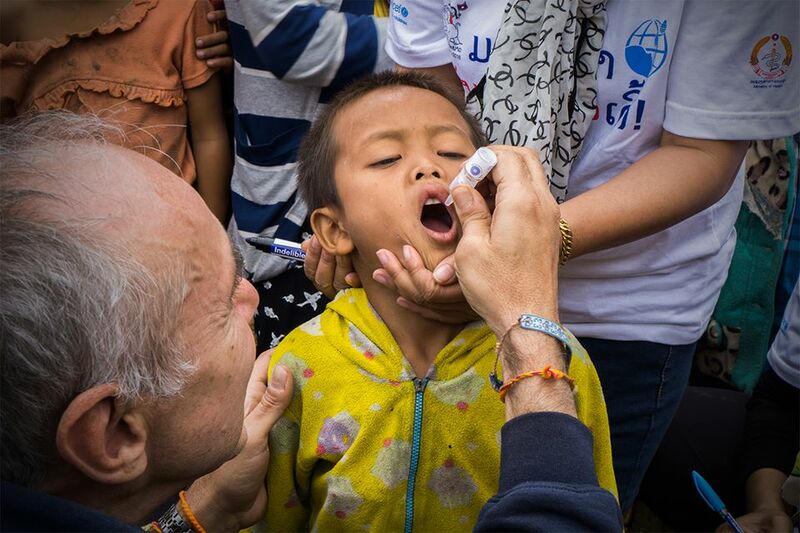 Most of you are aware that Rotary largest international project ever is to readicate polio around the world. 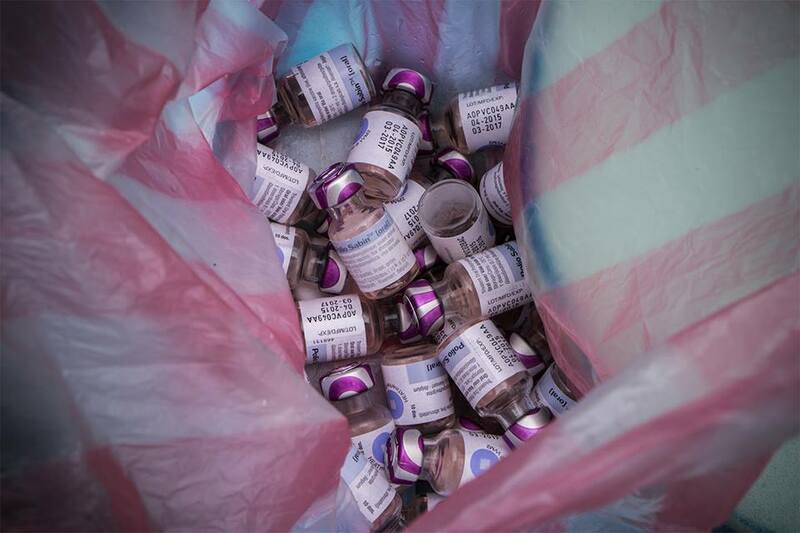 Until that is done, 3rd world countries continue to be immunized each year. With just two countries to go, we are THIS CLOSE! This was by far the highlight of my trip this year. The kids, awaitng their turn to receive the drops. 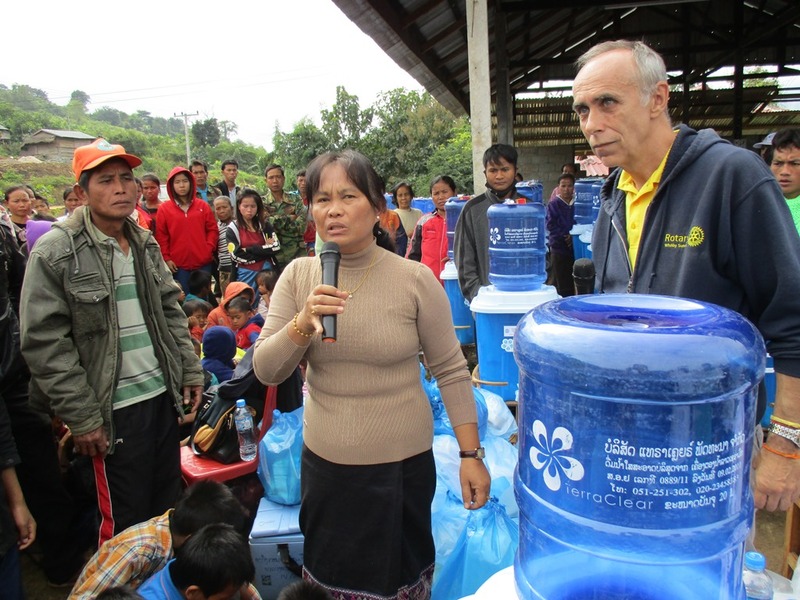 We took this opportunity to present to the Head of the hygiene office, a water filter on behalf of the village clinic. Next, we wanted to thank a very special lady in our lives..Dr. Anna Tucka who has graciously donated toothpaste, toothbrushes and toothpaste every year since we started distributing filters. We will offer thanks to additional sponsors in the coming posts – lots more to distribute. Thank you Anna! We will send you a short video upon my return to Canada. I should note that not everyone got their filters – 28 families did not show up because they were in their fields, at the hospital (due to sickness) or in another village. As a result, we will dsitributed these when we return in January. Some of you will not have received all of the pictures yet, because of this. For the Rotary funded filters, I will load the into dropbox for all to see and will email each club, the coordinates. 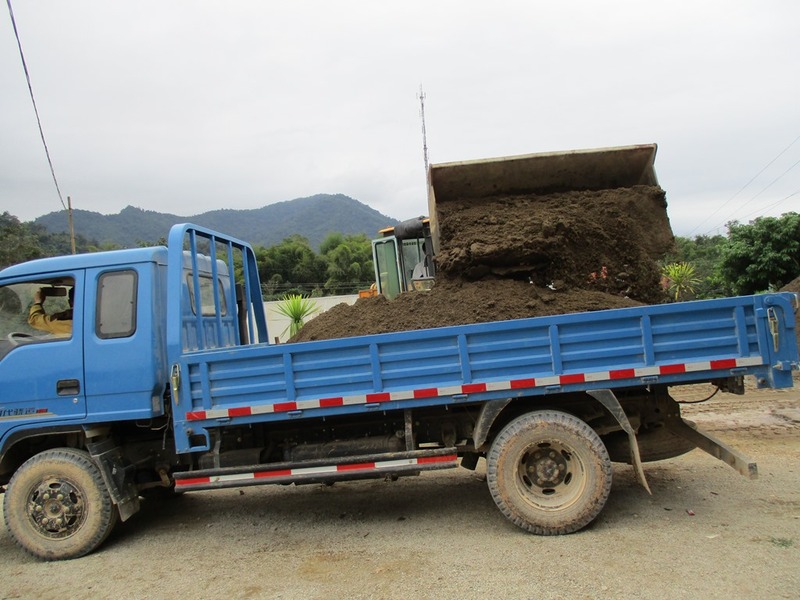 Once we had the first project well underway in ViengHin, and a schedule to roll-out the first 257 water filters, it was time to get our last major project underway…Donesok School construction. It was a heck of a long drive on a very bumpy road but we finally got there, after ensuring we hadn’t lost any limbs along the way. The village visit went well and the chief reconfirmed the village’s commitment to provide sand, gravel and wood for the framing of the roof. The first surprise however was that there were ony 16 students at the school, not the 63 students (with a waiting list for the next term to start). The chief told us that they had sent 20 students to another school until the new school was built. 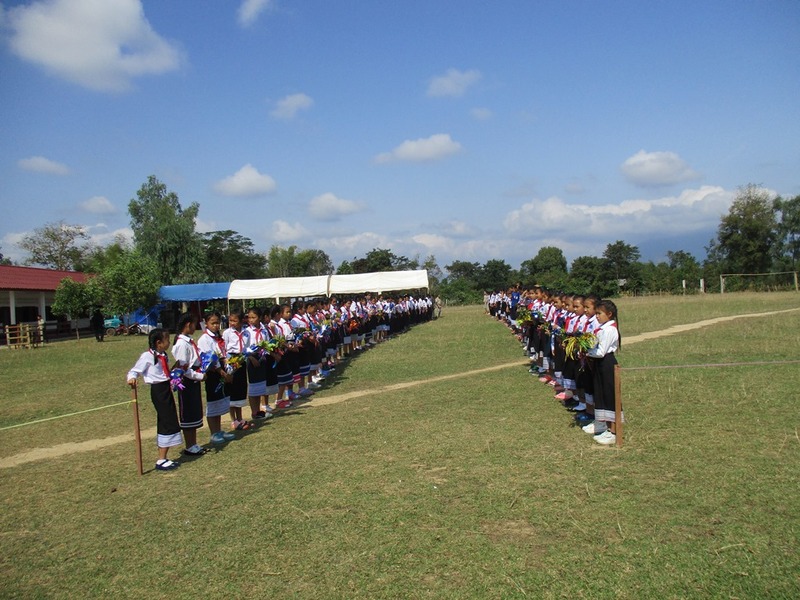 Still, tht made a total of 37 – We also so no evidence of other students that were old enough to go to school, but forced to wait until the new term (granted, they could have been working in the fields). 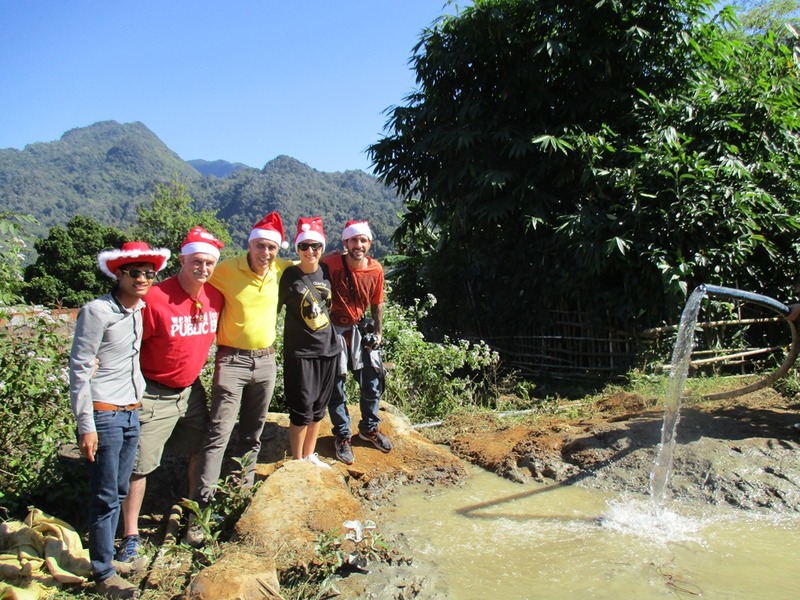 Concurrently we met with a water engineer for the dug well and had brought the builder for the school with us. Satisfied that everything was generally in order, we retired to a village with a guest house, about 2 1/2 hours away so that we could prepare contracts with the intent on presentation and signing the next morning. Things were not as they seemed…at all. The village met that night also, to discuss and to assign duty tasks but something did not go right at the meeting I guess. While I suspect some of it might have been politically motivated (perhaps a power struggle in the village), a decision was relayed to us that the villagers would not provide anything. Our team had previously noted that there was lots of sand a short distance from the school, on the banks of the river…free for the taking. This was extremely disappointing news…not to mention frustrating. Our own team had another huddle and it was agreed that it was unlikely that the villagers would maintain the school, pump and toilets either. With no skin in the game, the pride and ownership just didn’t seem to to be there. Even with their lies, it was a difficult decision to withdraw our support. This left us with quite a dilemma however. It meant finding a new project(s) quickly, emailing modification requests to our school donors and to all 19 Rotary Clubs for the water portion of the project. 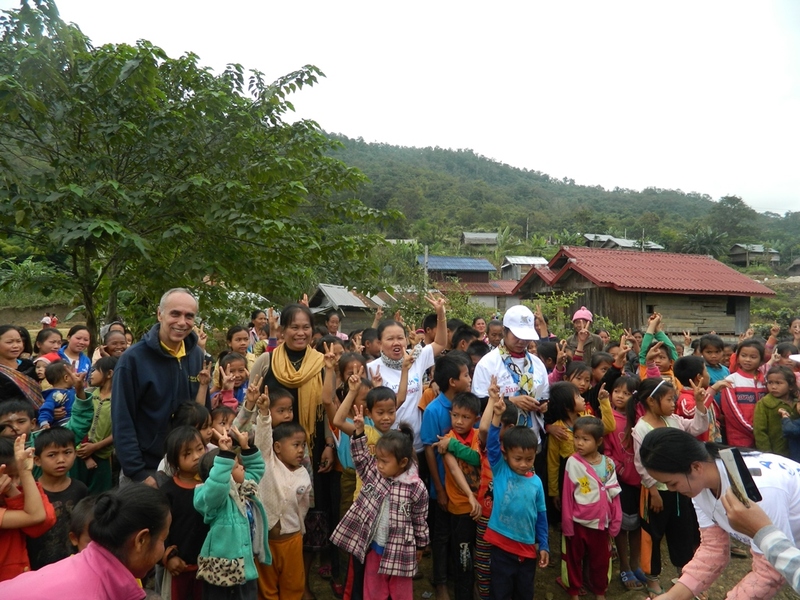 After reviewing all of the requests, it was decided to approach our donors to allow us to re-designate the funds to adding two more rooms to Katang Xieng School, provide a toilet bank to Pha Yong where we had done toilet banks before, and to provide additional water filters to the rural villages (currently there are requests for over 1200 systems). We just got final approval from the Board of Directors at Global Change For Children as the last major sponsor for the school, who announced their support for the change. Whew! 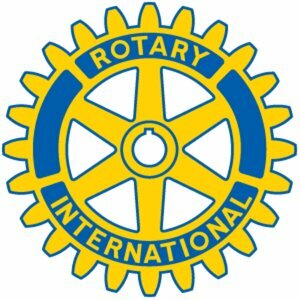 We are still awaiting decision from 3 Rotary Clubs and may have to return a small portion of funding to the Rotary District due to their funding rules -it doesn’t prevent us from reapplying for the same funds but the deadline is today and with the Christmas and New Years holidays upon us, there was just no way to process everything in time. Still, we are extremely happy with the results so far. So Katang Xieng will get two additional rooms (doesn’t need water/toilets because it was done last year), Pha Yong will get the final bank of toilets and there will be at least another 50 water filters (serving 250 more villagers). Fantastic! 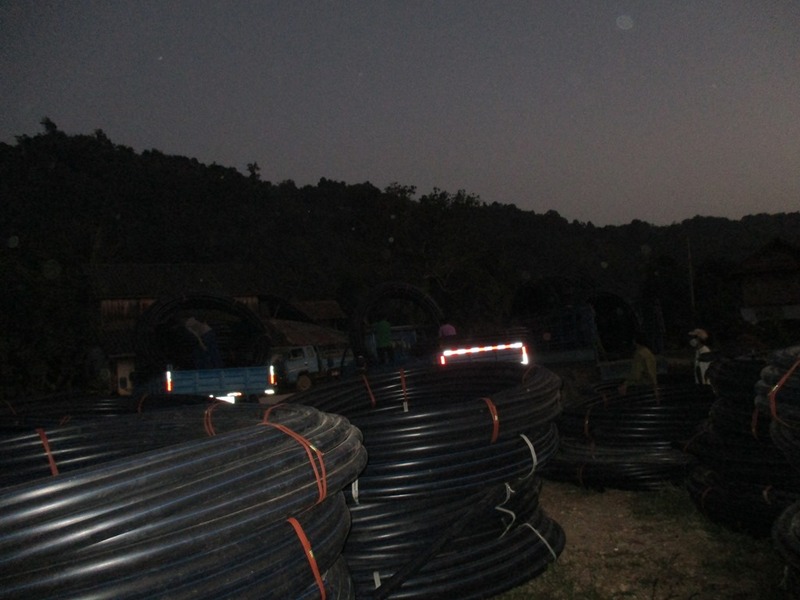 The 7km of pipe finally arrived in the wee hours of the early morning, from Vientiane. 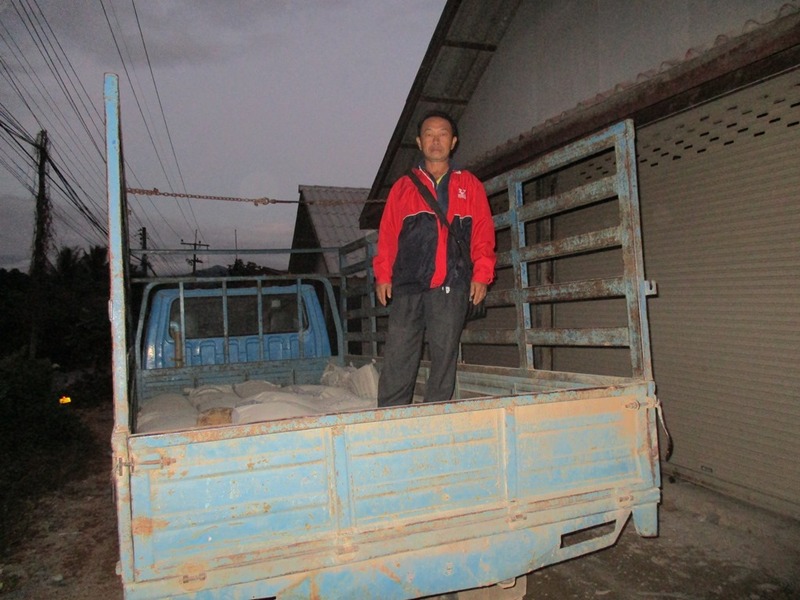 While it took a good portion of the day to unload from the big truck and count the inventory, it took only a few hours to reload onto 10 smaller ones and send them off to Vieng Hin. 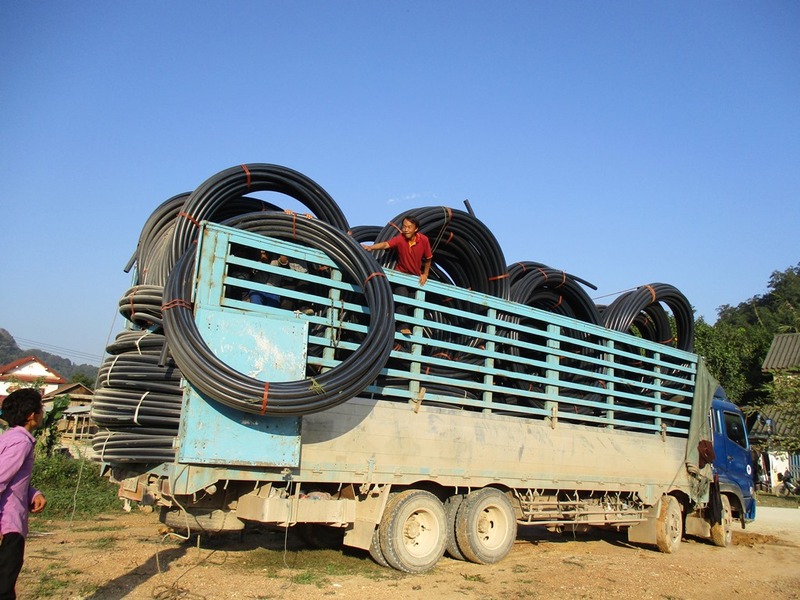 I was surprised that they managed to get all the pipe on one truck. 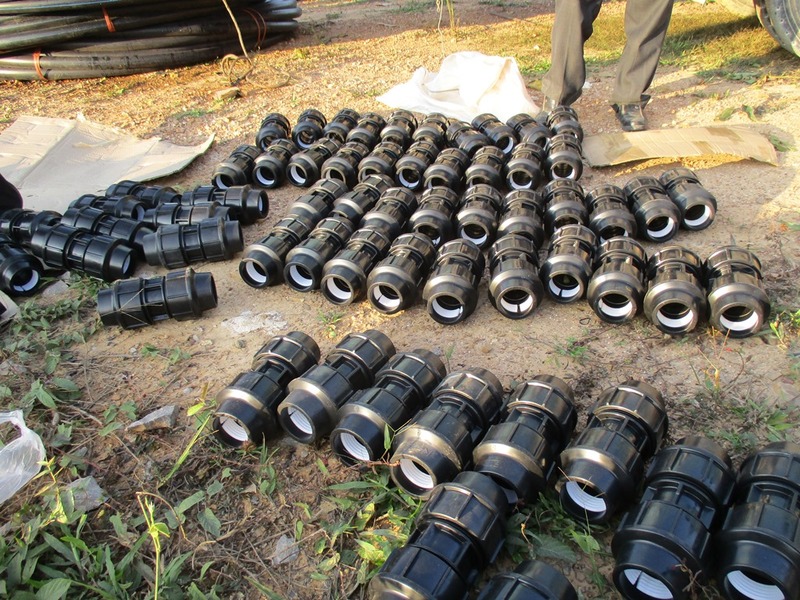 A Sampling of the dozens of connectors for the pipe. In two days we will head 6 hours south to celebrate the opening of a school by SKL Inc, a registered charity in Manitoba, and to inspect, negotiate and sign contracts for phase 3 of this water project (toilets and running water) plus a 3-room school. 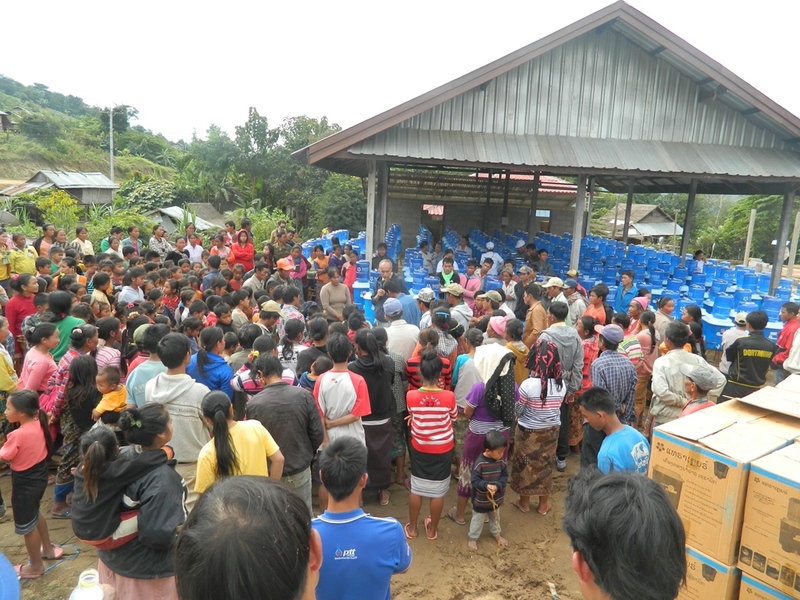 Right after that, we will do the first distribution of water filters for the season – 257 units for the Village of Nong Boakham. 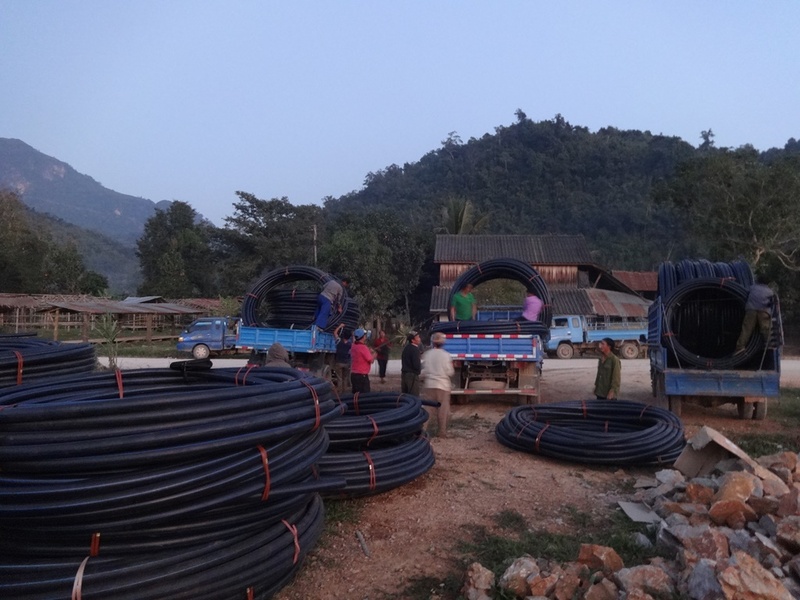 It has been a busy week with two Lao holidays and progress with our water project. 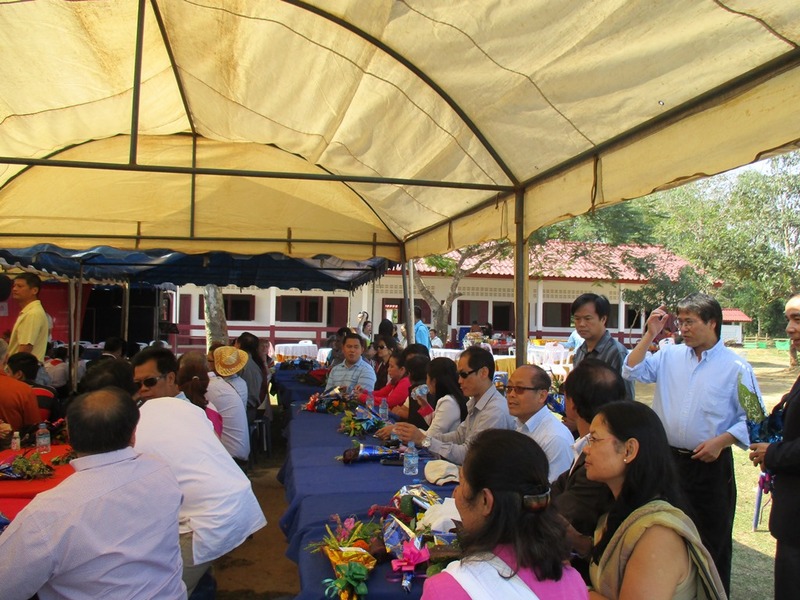 Monday was a National Holiday with the celebration of Lao Independence…40 years! It rained so the festivities were moved to the new stadium which doesn’t have spectator seats..only government invited. Still, it didn’t stop the celebrations with copious amounts of Beer Lao and loud music. 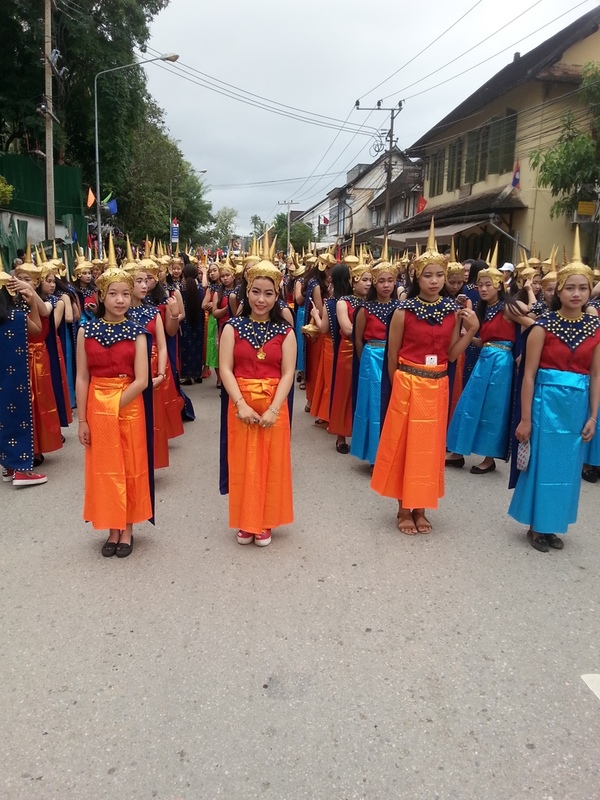 Secondly, there was the parade on Wednesday to celebrate the 20th anniversary of Luang Prabang’s Unesco Heritage Designation. Now that was a sight to see. 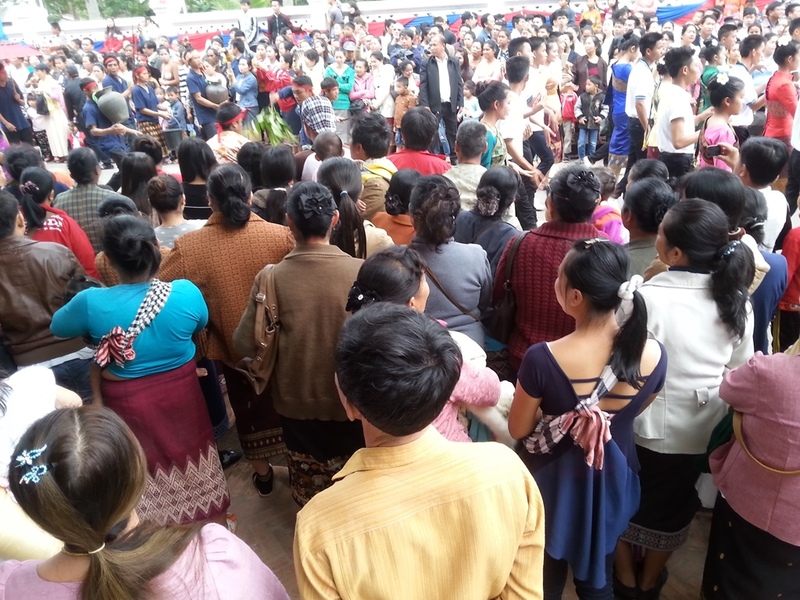 I think the entire population of the city was there to witness, along with neighboring villages…I couldn’t move! I found it strange in that one would normally wait along the parade route for the procession to arrive but the parade was so long that the participants lined up at least 3/4 of the way into the parade route itself. Those people had a very short walk to the end. The highlite for me was watching a team of 4-5 years olds paddling a boat (on float), led by this kid that couldn’t have been more than four years old…the little guy was really good too, shouting out orders yet keeping up the pace. Here are a few of the pictures. Entrants lined up at the start of the parade…the best time to take pictures..you will see why. Thousands and thousands of participants. Again, this group was awaiting the start of the parade. This was the highlight for sure. 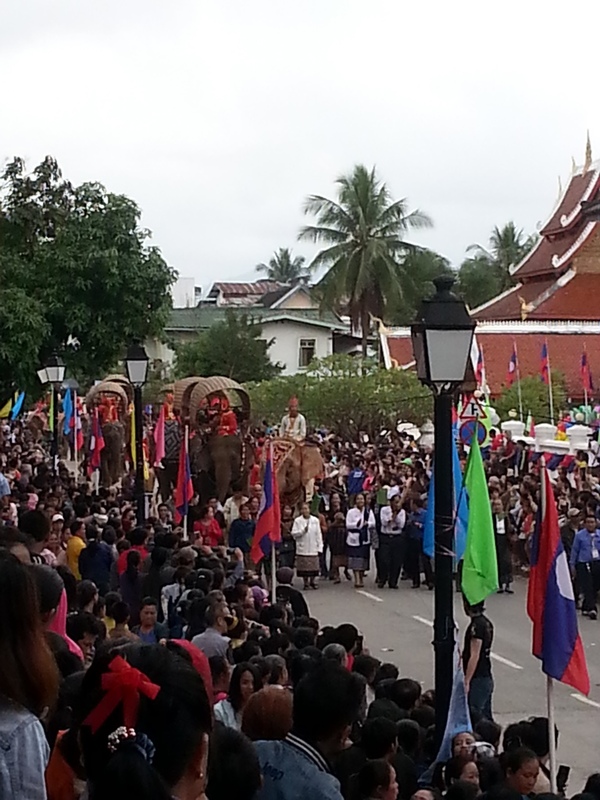 More than 20 elephants had made the trek 240 km away just to participate in this parade. I should note that I was there for the 15th anniversary – it is amazing how time flies. 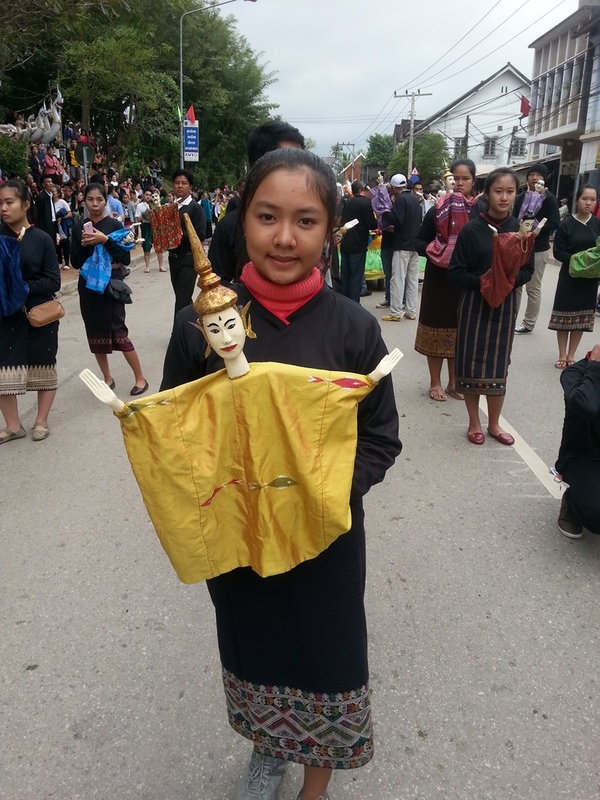 Meanwhile, poor Siphan tried to make it back in time from the village of Vieng Hin. He coordinated the transportation of 25 truckloads of sand, gravel, steel rods and cement. 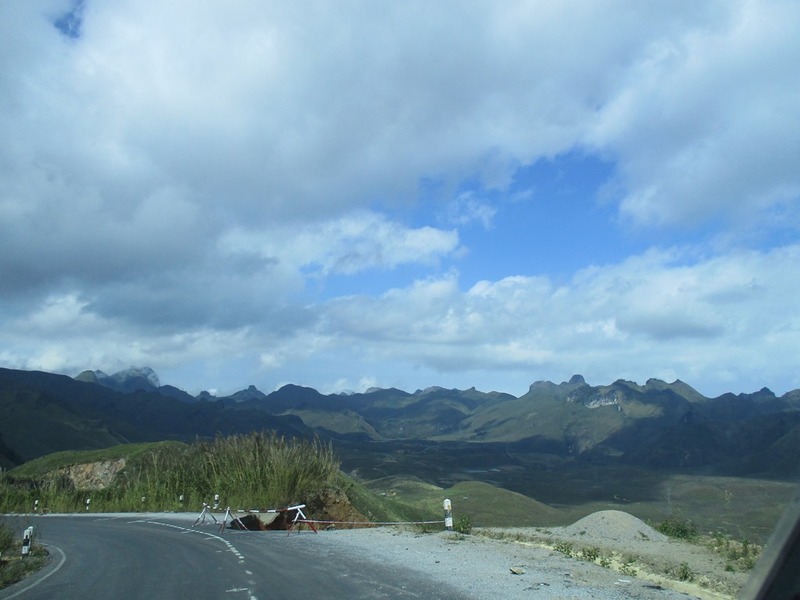 It rained on and off durng these days, and delaying the transport due to terrible road conditions. 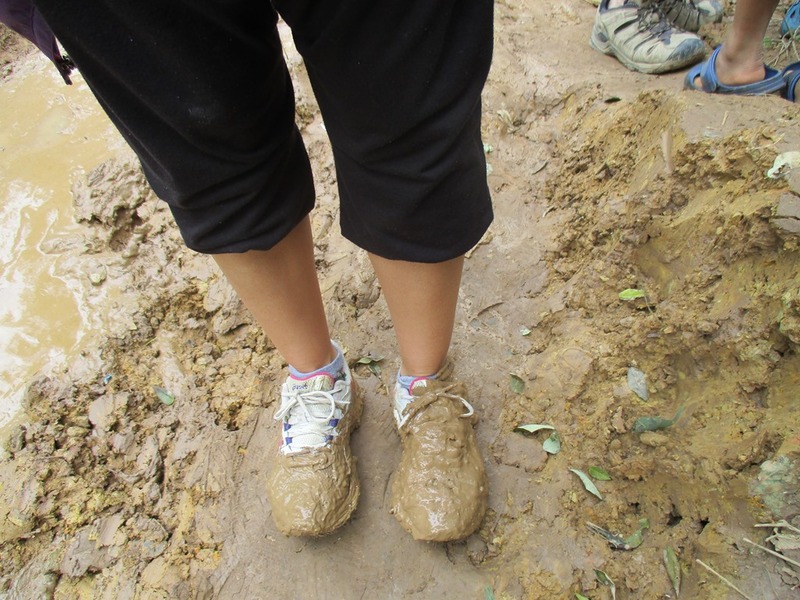 The roads were primarily mud and on dangerous hills. 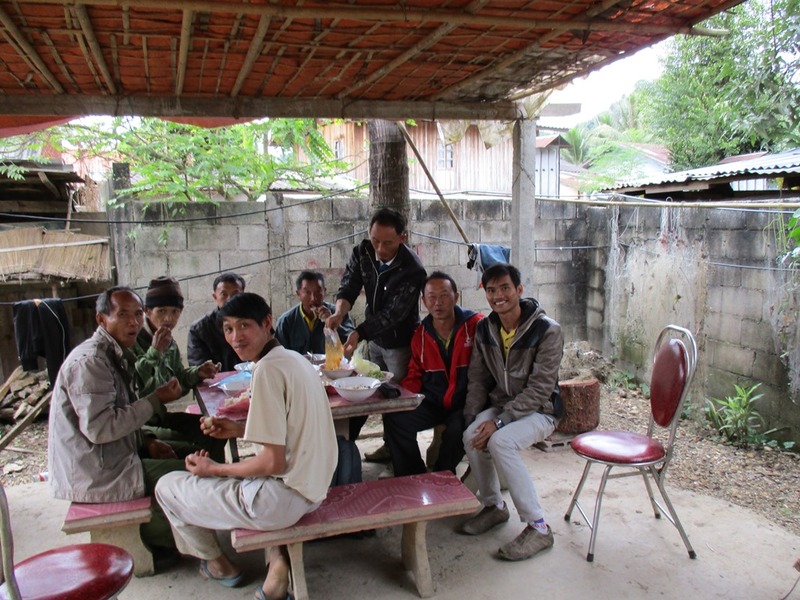 The drivers and village chief with Siphan enjoying a meal before the work begins. The last of the truck for the day, carrying cement. No deliveries after dark, for good reason. The Hmong Village Chief poses for the camera. 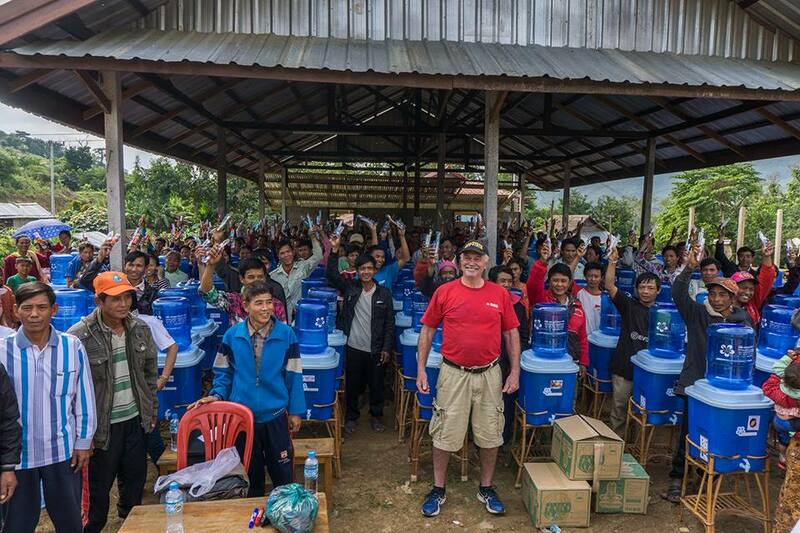 Last night, Art Quickenton arrived to assist us with the projects for the next two weeks, especially for the water filter distribution of 257 filters. This is an ‘all hands on deck’ affair. We may even convince a couple of other tourists to come with us…but first, welcome Art! We managed to take him for a quick meal before he headed straight to bed after his long journey. From the left, myself, Oudone (one of our university students who never declines a free meal), Siphan, Art and Serena (from Italy). Massimo, her husband is the photographer. The summer and fall were quite fruitful in the presentation and fundraising area. People and organizations seem to come from nowhere. We had hoped to raise enough for our two main projects, plus 250 water filters for our first distribution of the season and of course support for our 17 students and teacher. Indeed we hit all of those targets and we have enough water filters for our second water filter distribution of 200. So for the entire year, we hope to get donations for a last distribution of 200 by June 2016. 200 is the magic number to reach for a distribution due to volume discounts and shipping costs. The only thing I am wary of is the poor performance of a Canadian Dollar. I am still hoping for a miracle there in order to keep us within budget but it seems like a stretch. Ok, on to the fun stuff. 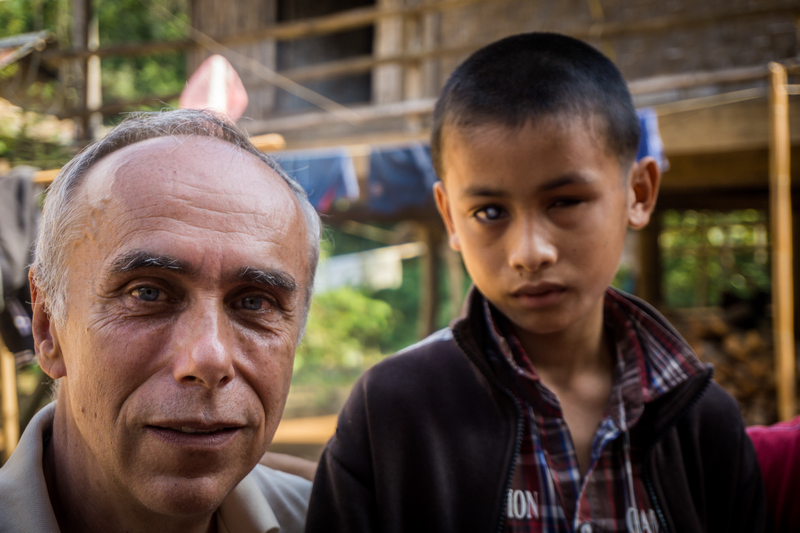 I have been here for about 1 1/2 weeks, have recovered from the jet lag and have completed our first village trip. We had been trying to contact the village to announce our date of arrival but to no avail. As it turns out, the village had a dispute with the telecom company so the telecom company shut off their service and link to the outside world (except by a very poorly maintained road)…I am pretty sure that wouldn’t be permitted in our country. 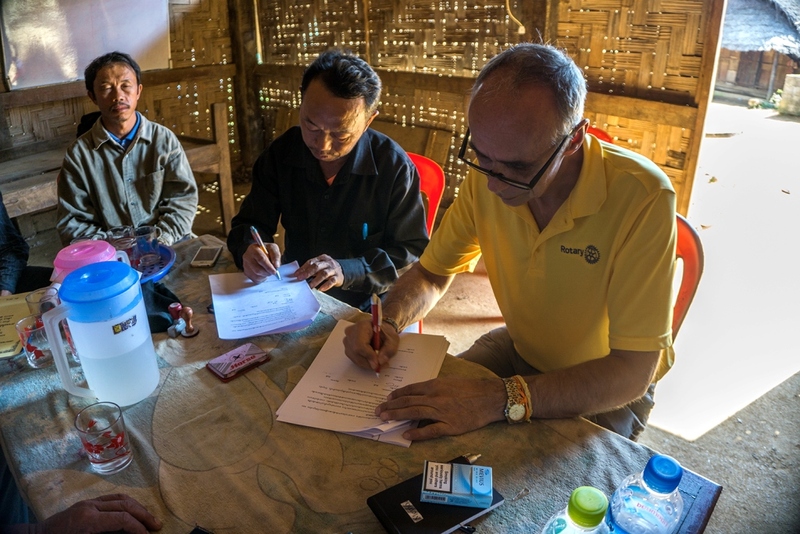 Our trip was to do the final negotiations and contract signing for our first, all Rotary Funded, Water Project in Laos. We will be watching the expenditures very closely on this one – based on the current cost to buy US, we will be $2700 over budget. We are looking at different scenarios to save, but will see. Fortunately, when we arrived, the 1st chief was there and the village was pretty happy to see us. They quickly arranged for a truck to take us (and the engineer who we brought) most of the way to the proposed dam site. We only had about a 15 minute trek to the actual site and it wasn’t difficult. Here are some pictures. 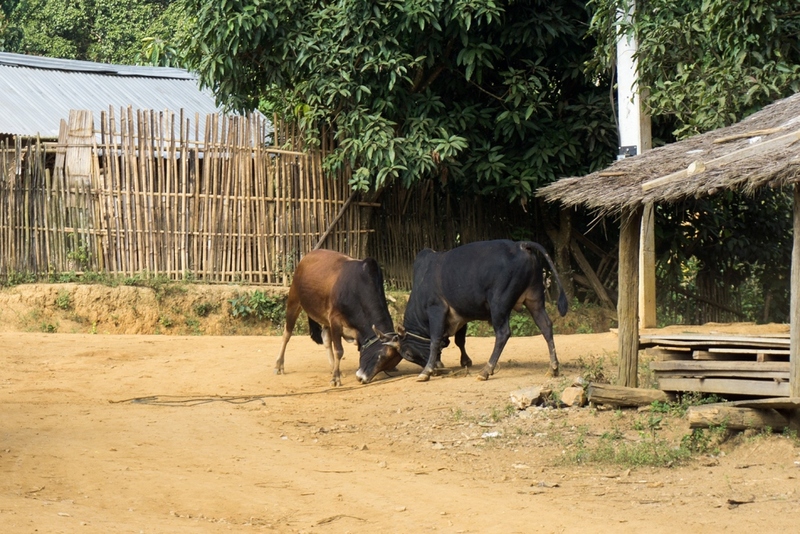 Bull Fight in Vieng Hin- both owned by the chief who wanted to know which of his bulls was the strongest so he could command more money from a potential buyer…the black bull was the winner. We saw another one loaded onto a truck and the chief mentioned that he sold it for about $2200, much larger than these. From the left: Team Members Serena and Massimo from Italy, and Siphan, our coordinator. Here we have begun the journey by truck towards the proposed dam location. 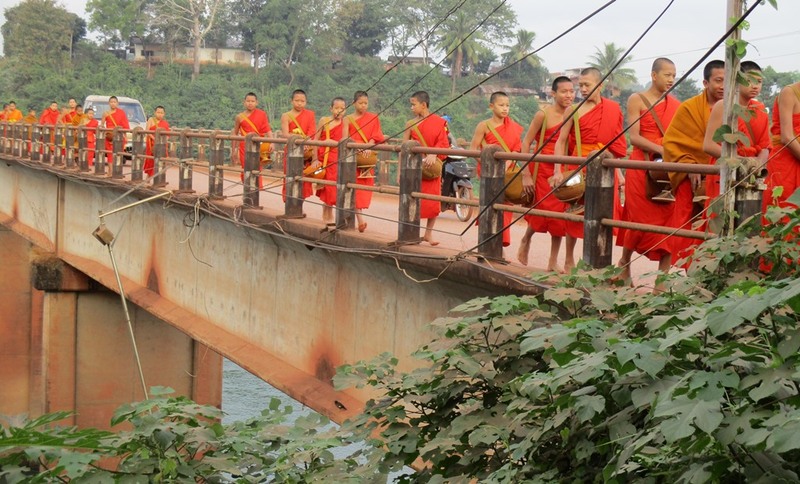 As we continue the journey towards the dam, we are reminded that today is the 40th anniversary of Lao Independence and a holiday for most. 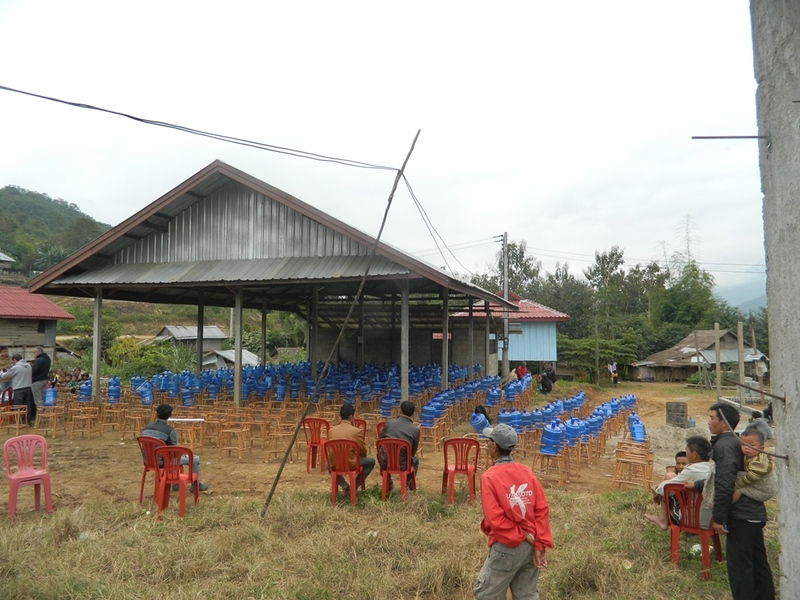 Further to the above captions, there used t be a Khmu Village and a Hmong Village in the area around us. 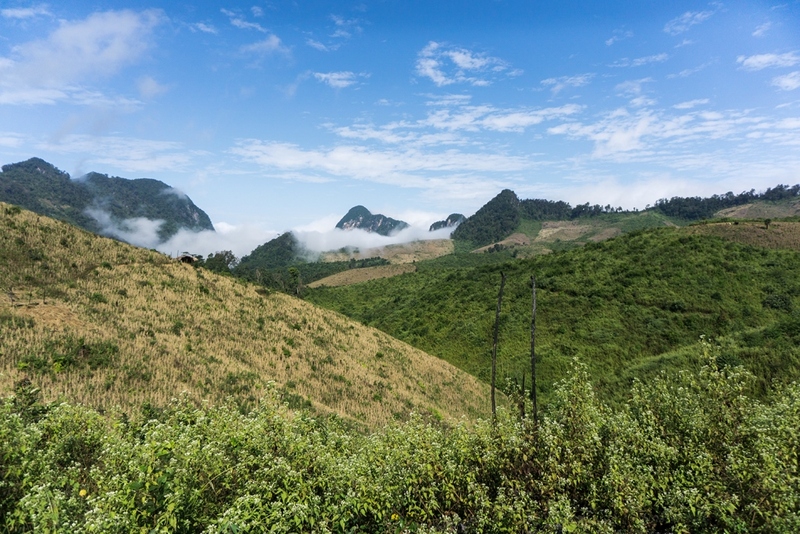 As it was described to us, the US bombing runs were particularly heavy in this area and while the villagers would run towards the caves for cover, most of the Khmu didn’t make it because they were slower than the Hmong. The villages themselves were completely wiped out. Along the route we asked why there was a ladder that led into the sky? Any guesses? 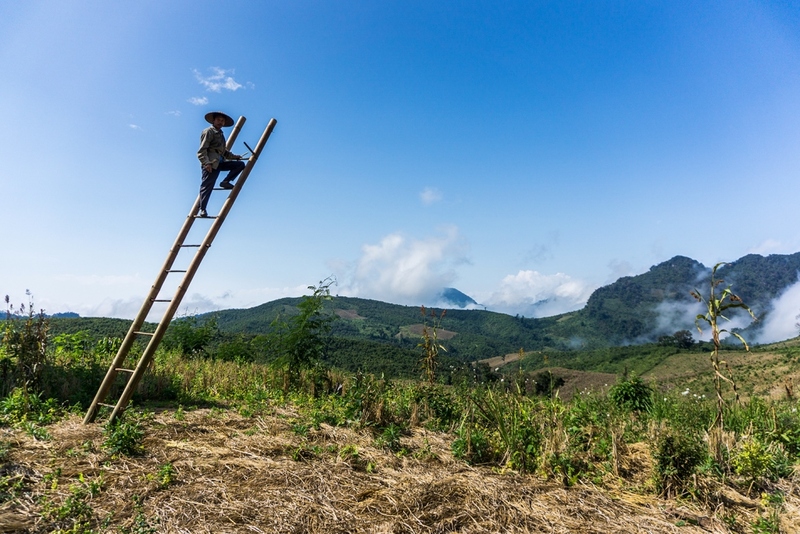 During the rice harvest, they would carry the rice up to the top and shake it to allow the chaff to blow away, leaving only the rice in a mound below…Pretty cool. 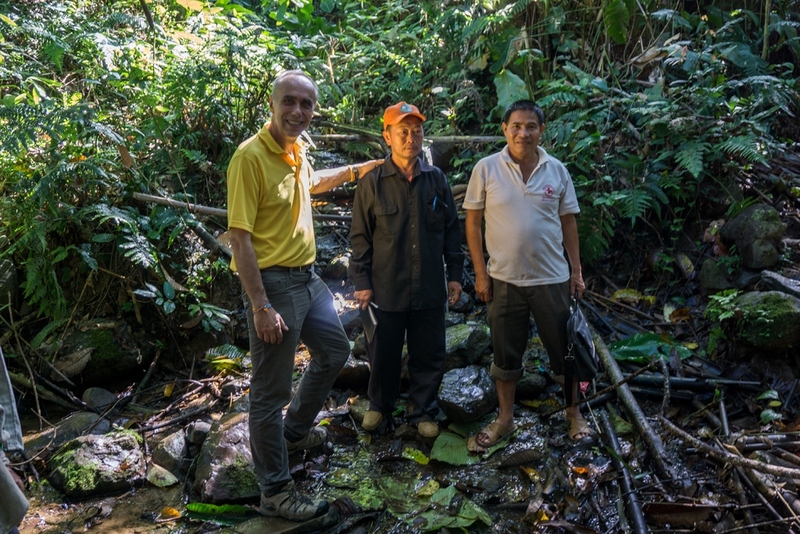 We made the short trek through a barley field and down a hill into the forest…then finally to the river where the dam is to be built. I am standing with the main engineer and the village chief. Back in the chiefs hut, we discussed the terms of the agreement, and the signing. What you can’t see is that we are in the only free area of the hut with mud floor. Facing the other way is just a wooden platform stretching the full length of the hut for sleeping on. In fact the people on the other side of the table were actually sitting on the edge of the sleeping platform. 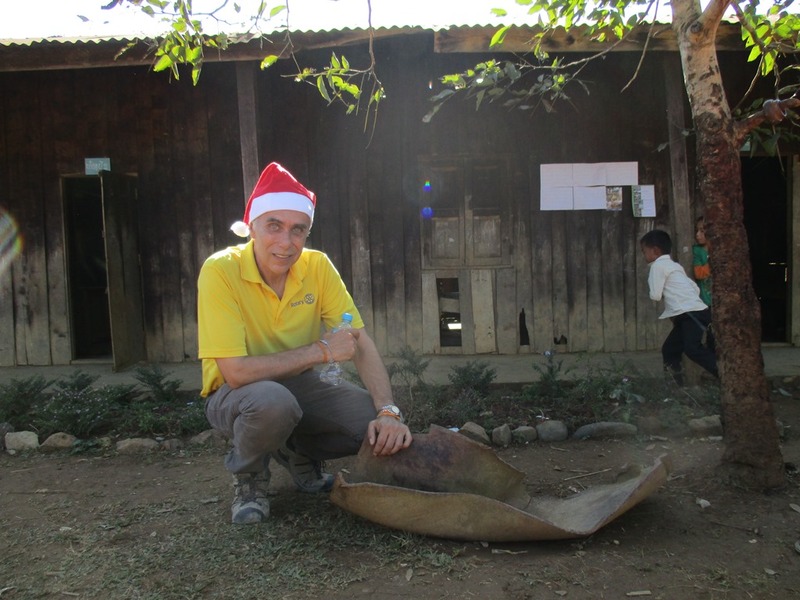 As soon as the next guest arrives, Siphan will head back up to the area to order and deliver materials to the village. 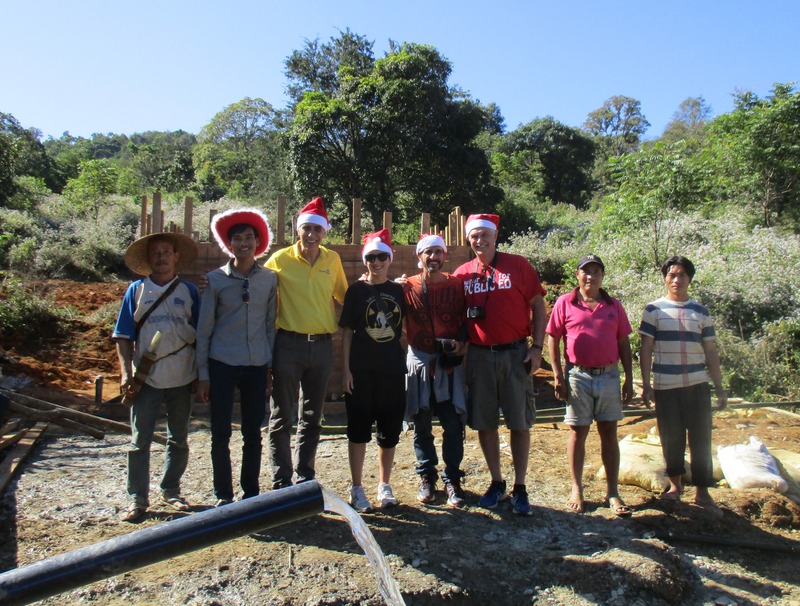 The villagers don’t want to waste anytime, in hopes of having the project completed in time for Hmong New Year which is only a few weeks away. More updates soon!